Molly Rampe, President and CEO of Choice Network, a pro-choice adoption agency with a larger purpose. Molly’s heart is so big and her mission is even bigger. She refuses to accept that any child should have to enter foster care. 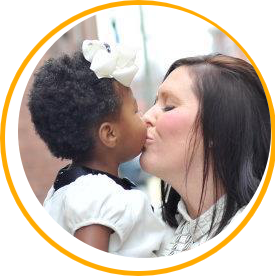 In fact, her adoption agency began when she herself plunged in head first by adopting her daughter, Gia. Now, Molly and her team are trying to create the world they want to live in – a world in which every child is surrounded by love and has a family. Ultimately, they help bring families together. In the process, they’re re-defining what families and adoption look like. 12:47 400,000 kids are in foster care in the US. 500 in Ohio. Every 120 seconds a child enters the foster care system. 13:39 Caring about life should mean caring about children in foster care too. 16:32 Why adoptions fail – lack of post placement care. We are changing that. 18:55 The hard parts about international adoptions. 20:56 When in doubt choose love. 21:41 Why we’re specific about the language we use: pregnant person instead of woman. 27:00 How do we get to ZERO kids in foster care? 31:13 The more open you are to ay child the quicker you’ll be placed with one. 33:22 Keith – why don’t you have kids? HRC states there are 2 million waiting LGBTQ families wanting to adopt, yet only 1 out of 5 agencies recruit specifically for them. Also again, stats such as – 80% of death row inmates are former foster youth; a child is entered into the system every 120 seconds; and 25% of foster kids are diagnosed with PTSD, which is double the rate of veterans – tell the story of what is happening to kids in the system. There are 36 waiting couples for every one baby available for adoption, yet their are 100,000 older kids in the system needing homes.